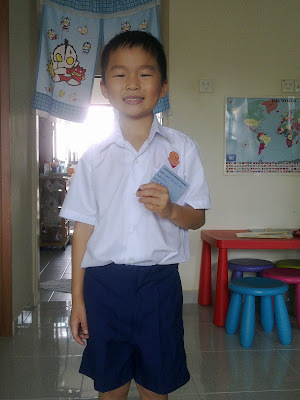 Jan 3rd 2011 was the day which marked the start of Monkey Boy’s 1st day in Primary 1. It was a really important day for both him and me. It was a reminder to me that my little boy has grown up and reach another important milestone in his life. For him it was the start of his academic life as a student in a large establishment ( school) of more then 1500 pupils. It’s a vast difference for him to have 30 students in his class as compared to only 5 pupils in Kindergarten 2. He will not be getting all the attention from the teachers like he used to get in Kindergarten also he would have much more to cope with on a daily basis. I was worried if he would be able to adapt to the changes and learn how to cope with the new timetable. Luckily my fears were unfounded and Monkey Boy was able to adapt to the new environment quite easily. Both of us started preparing for the 1st day of school about a month before. After the orientation in November 2010 we purchased the necessary stationary and books and got him a brand new schoolbag. We also got 2 sets of school uniforms and another 2 sets of PE- attire and school shoes to go alone with it. I labelled all of his books for him and wrapped them in plastic so that they could remain in their pristine condition longer. Monkey boy also got a new wallet and lunch box for school during the December holidays. How was your child’s 1st day of school? Here is the whole series if you have missed out any parts. Preparing for Primary One- Before Primary One	We’re Back!! I was like you when my son Kyle started his first day in primary 1. I was really worried on how he will face his new classmates and teacher. And I’m so happy on how it when along well and how he cope up fast on his new environment and classmates. I guess we have to learn to trust our kid that they can do it. Cheers to us proud mommies!